One of my favorite streets in Tribeca. A tiny new Tribeca condo building that looks old and replaces an empty lot. Sound like a perfect fit? Well hold your horses, because the 137 Franklin Street proposal is in a historic district, and there are rules to be followed. Like genuflecting to the Landmarks Preservation Commission, which yesterday didn't approve the seven-story, brick-and-steel Studio MDA design, but didn't dump on it, either. The commissioners supported the project but asked for some changes, like a bigger cornice, shorter windows (up top), taller windows (on the bottom) and less flimsy metalwork. Even preservation group the Historic Districts Council was largely on board, though the group's testimony asked for "more than a watered down reflection of surrounding structures," given the prominence of the Franklin and West Broadway corner. After a quick trip back to the drawing board this one should be up and at 'em soon enough. Community Board 1’s Landmarks Committee searched for words to describe Jeremy Edmiston’s proposed redesign of 187 Franklin Street. with two added floors and windows angled east and west at 30 degrees. “It’s almost like a warp in time,” Jeff Ehrlich said, contrasting Edmiston’s concept to the mostly 19th century buildings on the block. “It looks like Star Wars and Mardi Gras combined,” said Noel Jefferson. 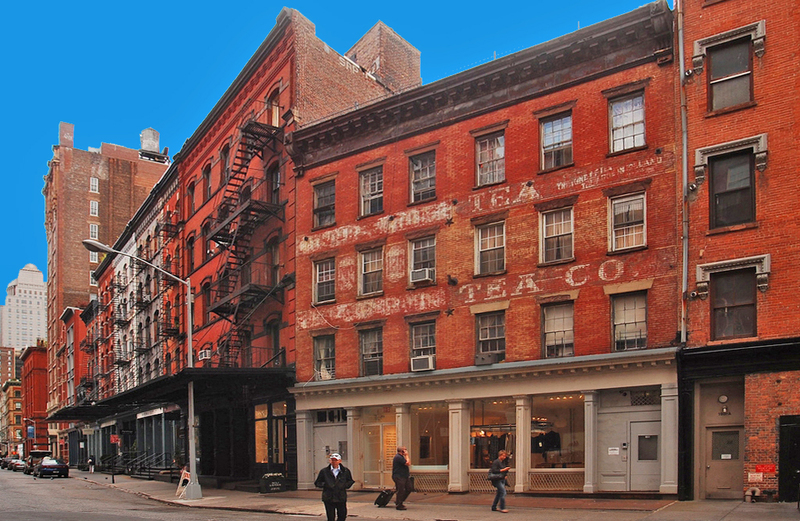 The committee was of mixed minds over the suitability of such a building in the Tribeca West Historic District and took no position at its meeting this month. Edmiston said he intends to meet with the committee again on Nov. 17 before they takes a vote, which is advisory to the Landmarks Preservation Commission. The commission will hold a hearing on the plan later in November. Now a squat, three-story single-family home, Edmiston wants to add two stories, which would bring it to the height of its neighboring buildings. He said the current structure only dates to the early 1990s and the Landmarks Commission has already determined that it can be demolished. Edmiston said his clients want more sunlight than their windows—all facing north—can provide. And he said they need added privacy, too, with the Tribeca Film Center across the narrow street from them. “It is a residential building directly opposite a commercial building. They were constantly staring at each other,” Edmiston said. second from right, and other buildings on the block. None of the windows in Edmiston’s design face at a 90 degree angle to the street. Instead, they are recessed and angled at 30 degrees east and west, catching more sun in the morning and late afternoon—and no straignt-on views into his clients' home. The plan also calls for four 23-inch deep balconies, which the architect sees as a way to provide additonal depth to the facade, much as the protruding cornices, window frames and fire escapes do on existing neighborhood buildings. In a statement to the Trib, the building’s owners of 13 years, who asked not to be identified, said they were planning an addition to the building because they have “outgrown” their space. Very nice. I want it . Residents say a new building proposed for TriBeCa’s historic district is too modern for the neighborhood. Architect Jeremy Edmiston wants to add two stories to an existing three-story building and alter its facade. TRIBECA — A radical new building proposed for TriBeCa’s historic district is too modern for the neighborhood, a panel of residents said Wednesday. Architect Jeremy Edmiston wants to transform a three-story private residence at 187 Franklin St. into five stories of undulating brick columns, sweeping balconies and tilted windows. Edmiston, principal at SYSTEMarchitects, said he was inspired by TriBeCa’s history of intricate brickwork and dynamic facades, and he wanted to interpret those ideas in a new way. But Community Board 1’s Landmarks Committee voted five to three against the design Wednesday night, calling it "controversial" and "too contemporary." The board’s opinion is advisory, and the city Landmarks Preservation Commission will make the final decision. The bold design was partly inspired by the family that owns the building, who want to add in extra privacy, Edmiston said. To avoid having the house’s windows look directly into the office building across the street, Edmiston decided to tilt them so that they look to the side, not directly forward. He then framed the windows in curved arrangements of bricks and added perforated steel balconies suspended from the facade. Edmiston made several changes to his design after CB1’s Landmarks Committee first objected to it last month, including toning down the color of the bricks and matching the building’s top to the height of its neighbors. But many of the committee members said the building design was still too modern. "It just doesn’t fit in the historic district," said Noel Jefferson, a committee member. She said the balconies looked like Band-Aids. Marc Ameruso, another committee member, said the building looked more like a temporary art installation than a contextual member of the historic district. Board member Vera Sung said she wanted to like the design but struggled to understand it. "I don’t know if I’m too conservative," she said, "but I can’t bring myself to accept it, and I don’t know the reason why." Several board members liked the design and voted to support it, but they were outnumbered. Corie Sharples, a board member who is also a principal at SHoP Architects, said she liked that Edmiston used high-quality, historic materials, and she said the proposal was better than the "blandly contextual" designs the committee often sees. "The design is pretty aggressive, but I don’t think that’s necessarily a bad thing," Sharples said. After the meeting, Edmiston appeared frustrated by the board’s vote. "It’s disappointing to see how reactionary the board is," Edmiston said. "Clearly TriBeCa is a contemporary neighborhood. Nobody is suggesting we return to historic forms of transportation or historic forms of communication…. It’s unclear what would in fact pass [at the board]." Edmiston declined to name the building owners, but said they are a husband and wife who have 10 and 13-year-old sons and want to expand the buidling so they have more living space. The current three-story building on the site was built in 1995, so the city will not object to tearing it down, but because the lot sits in a historic district, the Landmarks Preservation Commission has to approve the design of the new structure. Edmiston could take his design to the Landmarks Commission as soon as next month. Sharples is sharp; this is one 'snazzy' looking building. It also looks ridiculous . It doesn't have to be bland, but definitely contextual here. Too modern, now too bold. This illustration makes it look marginally less ugly. New York may think of itself as avant garde when it comes to architecture, but plans for a modernistic makeover of a traditional townhouse in TriBeCa have run into resistance. 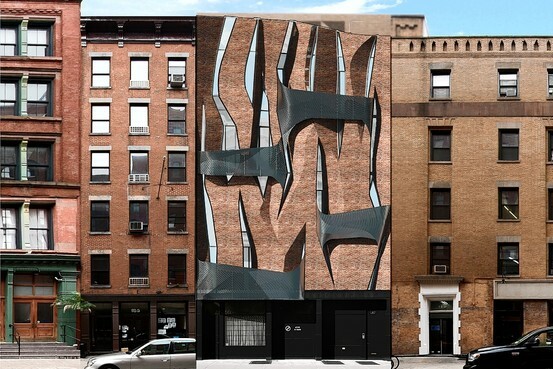 The building's owners, Douglas A. and Michelle D. Monticciolo, propose taking a basic brick-faced townhouse at 187 Franklin St. and transforming it into something that looks like it hopped off a Picasso canvas. The windows would resemble jagged shards of glass. Short, irregular-shaped balconies made of perforated metal would be added to the building. The plan also calls for adding an additional two floors to the three-story structure. According to property records, the couple bought the building for $880,000 in 1997. Last week the landmarks committee of the local community board voted 5 to 3 against recommending the project to the full community board. The plan is "extremely modern, extremely bold and extremely lovely, but in our opinion not quite right for the location," said Roger Byrom, co-chairman of the landmarks committee and one of the "no" votes. "In another location it may be perfect." Late Tuesday, the full 50-member community board was scheduled to vote on whether to recommend the project. The project then goes to the Landmarks Preservation Commission for final approval. 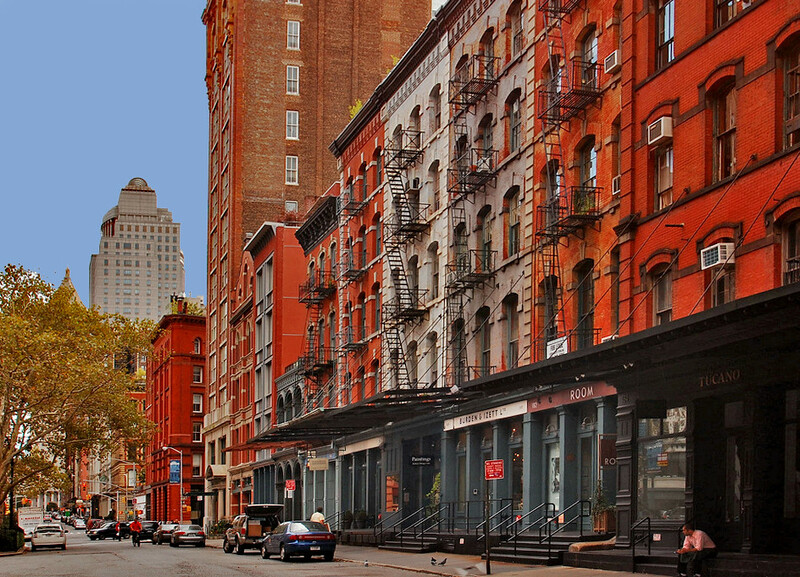 Built in 1995, the building is surrounded by commercial buildings in the middle of TriBeCa's historic district. The owners want to add another 1,500 square feet of space to the small building, according to the project's architect, Jeremy Edmiston, a principal with city-based SYSTEMarchitects. The owners requested a unique living space that also protected their privacy, Mr. Edmiston said. So the design of the new building would use angled windows that face down the street in both directions instead of allowing for direct views inside. "When it became apparent that we were bumping into the limits of the space in our home, we decided to explore the option of adding on vertically," Ms. Monticciolo said via email. "Since we had known Jeremy for many years through our church, we naturally turned to him to work with us as we considered our options....We have lived in Tribeca for many years, and we love it. The community is vibrant, and we want our home to contribute to the neighborhood. The facade is designed to bring together both functional and artistic elements in a manner that complements the neighborhood and its heritage." Still, the design was too much for some neighbors to handle. "It's aesthetically disturbing to more conservative audiences," said Bruce Ehrmann, a co-chairman of the landmarks committee who voted in favor of the project. "It was not pleasant, but it was arresting. It's clearly well thought out." Mr. Ehrmann said the project raises the question of what role contemporary architecture should play in historic districts. 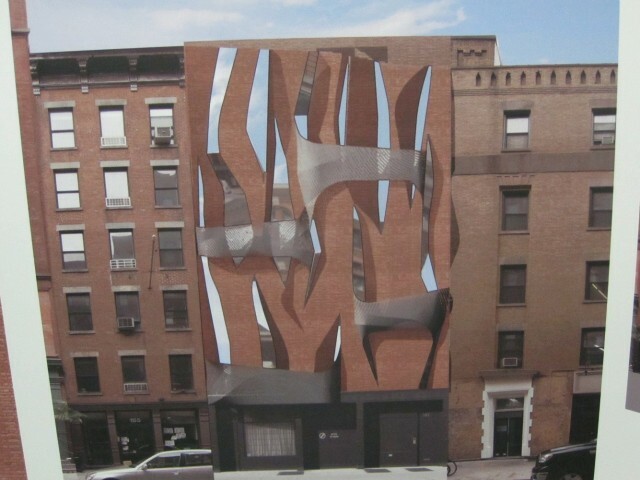 Pointing to the wave-shaped Synagogue for the Arts building in TriBeCa, Mr. Ehrmann says there is room for modern buildings to reside next to historic structures in certain circumstances. The architect of 187 Franklin, Mr. Edmiston, feels his project is one of them. He argues that his design's use of brick and metal also draws inspiration from the historic buildings in the neighborhood and takes that concept to another level. "I think it's hard for a lot of people to understand all of the aspects of the design in a single image," Mr. Edmiston said. "Intelligent minds can disagree about what isn't appropriate." ^ That is really beautiful. In their low-key way, these guys are as good as European starchitects. Makes you wish this represented the norm for average background architecture.